Enough time has passed now since Friday’s fourth egg to be as sure as we can be that there will be no more additions to the clutch. I don’t know the exact time of laying, but by 06:00 on Friday morning the male was sitting tight on the nest and when he shifted at around 07:00 I caught a glimpse of four eggs. This was certainly the longest gap between eggs and was a maximum of 70 hours since the third was laid, and just over a week for the entire clutch to be laid, during which time the first and second eggs have been left uncovered for many hours at a time (including overnight). It’s typical for a female to lay the same number of eggs from one year to the next, and for the eggs to have a similar colour and pattern, giving them a sort of ‘fingerprint’. 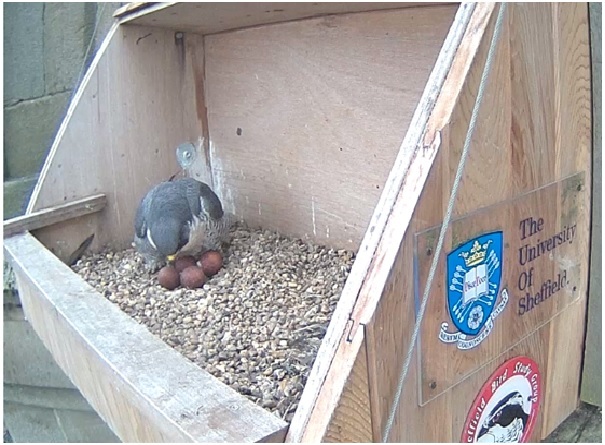 Peregrine eggs vary from close to white background with reddish blotchy markings through to brownish, but the eggs of the St George’s female are a deep ruddy shade with few darker markings. They’ve been the same for the four years they’ve used the nest. 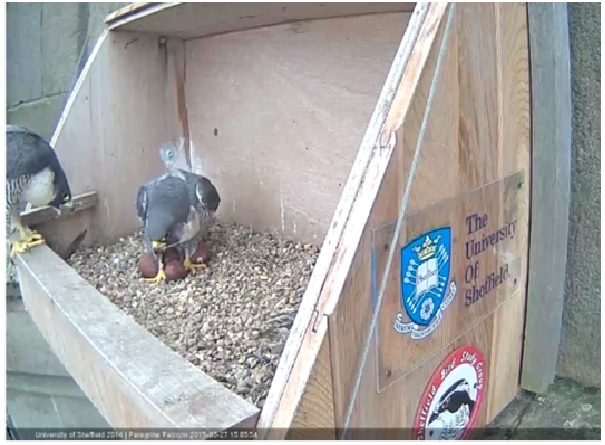 The eggs were briefly left unattended during a changeover at lunchtime, allowing confirmation; the new egg still looks a slightly paler, ‘shinier’ tone. A clutch of 4 eggs is probably the commonest, with 3 eggs the next most usual, these two sizes accounting for about 98% of clutches. About 2% lay 5 eggs and 6 has been recorded, as have 2. A clutch of 4 eggs represents about a sixth of an adult female’s body weight. Both birds will take it in turns to incubate almost continuously now until the eggs are ready to hatch, which usually takes 30-32 days. In 2014 the first egg hatched on April 28th, and with a first laying date a day earlier than last year we might hope for the first hatching on April 27th, but that’s far from scientific! Incubation stints vary quite a bit, from half an hour to a couple of hours during the day, and then longer at night, when the female tends to take over. The male has been doing at least half the incubation from what I’ve seen and has been reluctant to hand over to the female on occasion, though he tends to give way to her larger size with a little persuasion, as below. We’re probably in for a few rather steady weeks as incubation goes ahead, but there will be much of interest no doubt via the webcam and opportunities to watch the birds as they come and go, either via the panoramic camera or live in situ. Blog updates will follow as and when there’s much to report, but in the meantime enjoy the views. And now we have four! This is exactly a year to the day since the final egg was laid in 2014, and presuming this to be the last egg of this brood (five is possible but unlikely), this would leave us with the same estimated hatching date of 24th-27th April. Last year we were almost correct – cracks were starting to show on the 27th and the first chick arrived on the 28th. 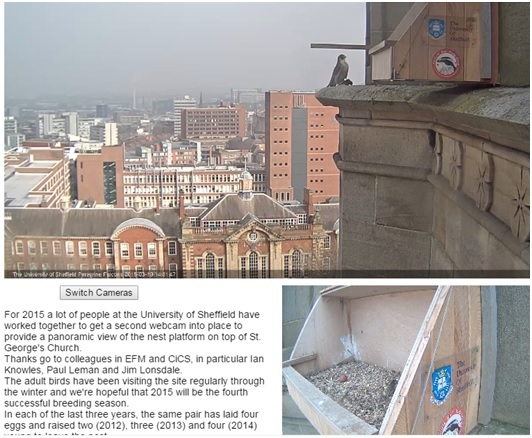 Keep posted on various outlets for updates – this blog, of course, for David’s detailed analysis, and also the Peregrines Twitter feed and SBSG Facebook page. Here’s hoping for another successful year! It’s been a busy day at St George’s. 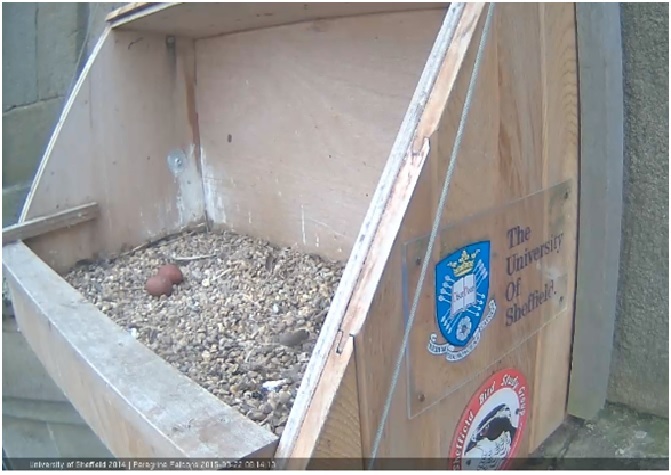 As anticipated, the third egg has arrived: knowing that it was likely to be laid at some point this morning, I had a look at the webcam early on and saw the egg appear at 07:47. The female had adopted an unusual posture on the nest and kept ‘pumping’ forwards and backwards. Suspecting that something might be about to happen, I kept watching and when she stood up there was a third egg, fresh and shiny, quite a different gloss colour to the more matt look to the eggs once they’ve been in the nest a while. She then spent quite some time again looking pretty exhausted, standing over the eggs before settling down to incubate. Again, the male soon came to take over and has spent several lengthy stints on the eggs, at one point noisily seeing off the female when she returned to the nest to take over the duties. When he did leave, as in the picture below, three eggs could be clearly seen. So that’s a gap of exactly 55 hours between the second and third eggs, following about 57 between the first and second. This is different to the pattern last year, when the gap between second and third eggs was 70 hours, by far the longest. I’m expecting a fourth egg, as this has been the clutch size every year for this pair, but perhaps the gap to the fourth egg will be a little longer than we’ve had so far this year. My guess would be that Thursday afternoon-evening will be the time to look out for this, if indeed it does happen. In the meantime, we’re likely to see the birds spending an increasing amount of time incubating the eggs. 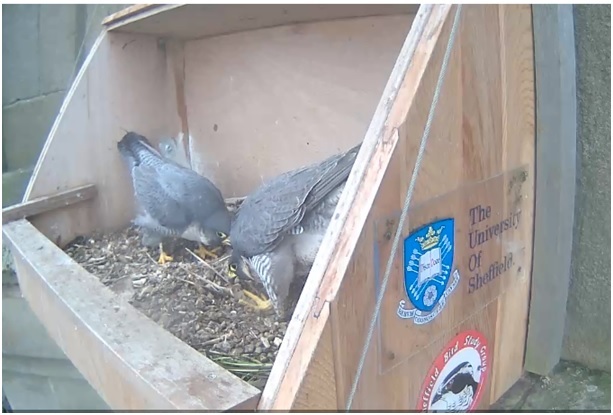 Further excitement came this morning as a third bird joined the pair at the nest site, captured via the webcam by viewers, to whom thanks for the image below. With the female on the nest, the male on the perch and another on the ledge, that’s definitely three together. It seems almost certain that this is one of last year’s immatures that has remained in the area, though it’s not been regular around St George’s in recent months. It could just be the light, but it does look to have a buffish wash to the breast and there’s a suspicion that it’s carrying a ring on its right leg, though it’s impossible to be sure given the resolution. 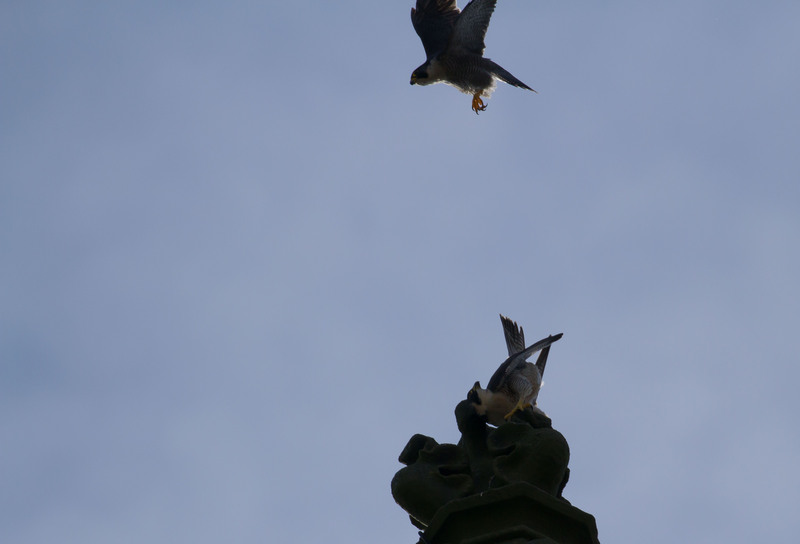 It’s highly unlikely that the pair would tolerate a complete stranger at the nest site, and fights between Peregrines over nest sites and pairings can prove fatal. Definitely one to keep an eye out for, and the mask pattern looks different to the resident birds as a way of identifying any ‘strangers’. 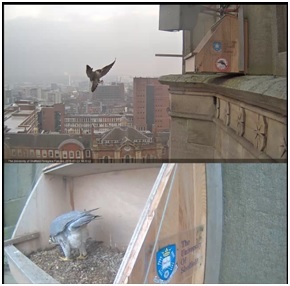 On a visit after work yesterday evening the pair was again seen to copulate on the ledge by the nest and Helen asks if they copulate for each egg. I don’t think they do, as copulation takes place fairly regularly over the space of several weeks (observed since late February this year), but it’s likely to stop once the clutch is complete as it’s initiated by the female, who calls repeatedly to the male and indicates her readiness by adopting a head bowed posture. 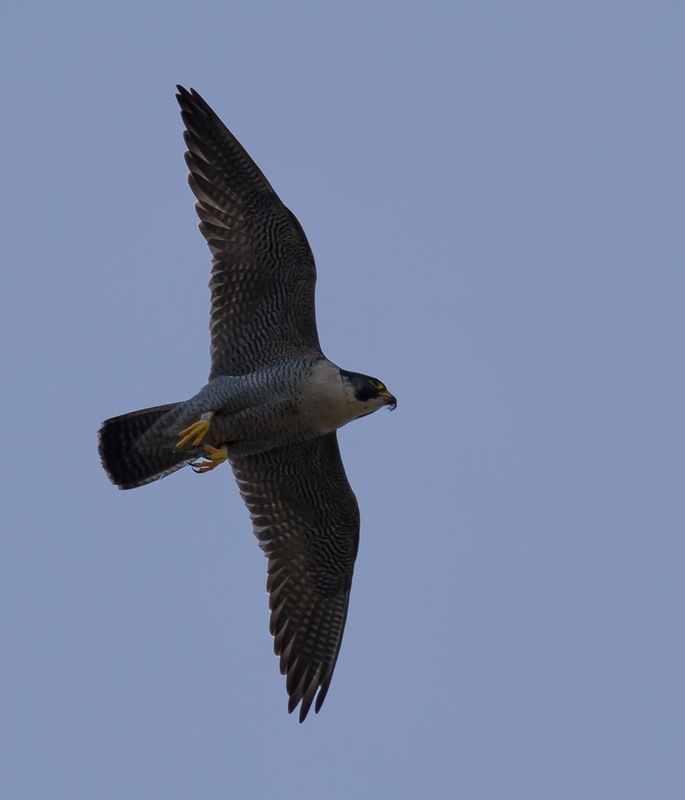 The other interesting behaviour yesterday evening was a food pass, the male coming in with a prey item, calling the female off the nest and then following her away before dropping the prey, which she captured in mid-air. It was fantastic to watch, but took place in a flash behind the branches of a tree, so no chance to get a photo to share the moment. 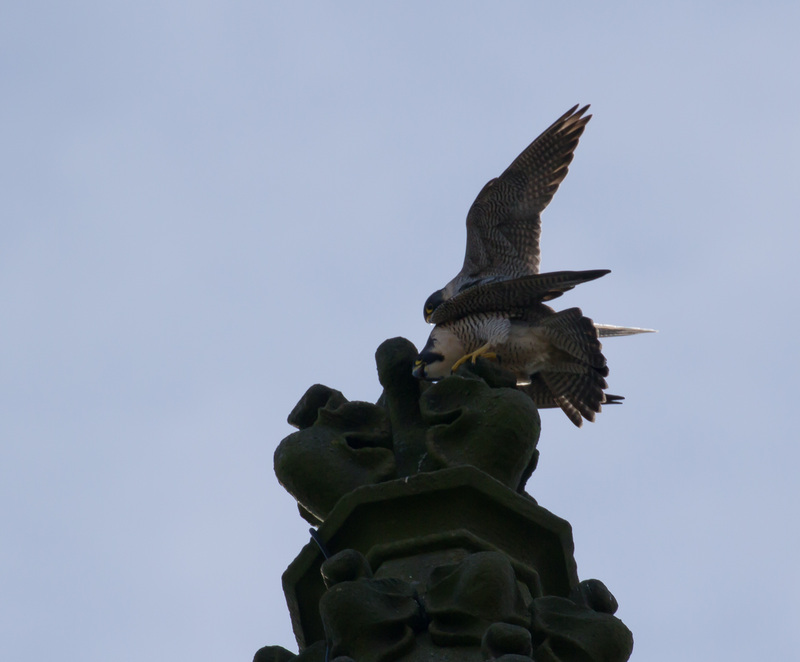 The image above was taken soon after as the light began to fade and both adults were very active around the tower. Finally, having missed the chance to capture the eclipse with a camera, below is the best effort from my wife’s mobile phone as one of the birds came into land with the eclipse (honest!) in the background. 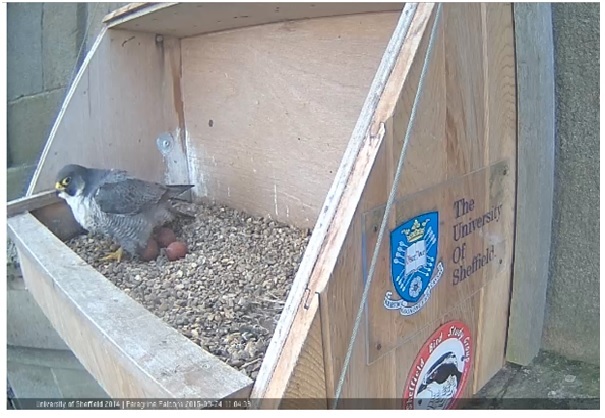 The (nest)boxing is proceeding nicely, with the second leg laid early on Sunday morning. A comment from Jane B says that she saw it laid at 00:47 – that’s dedication for you! So a gap of about 57 hours between egg one and egg two. Both adults have been incubating occasionally, but the eggs have also been left uncovered for extended periods of time. This is quite normal and nothing to worry about. The SBSG Twitter feed captured a fantastic shot of the sunrise on Friday, ahead of the eclipse. The sky clouded over but cloud thinned and the eclipse was great at St George’s, but sadly I didn’t have a camera with me to share the sight. 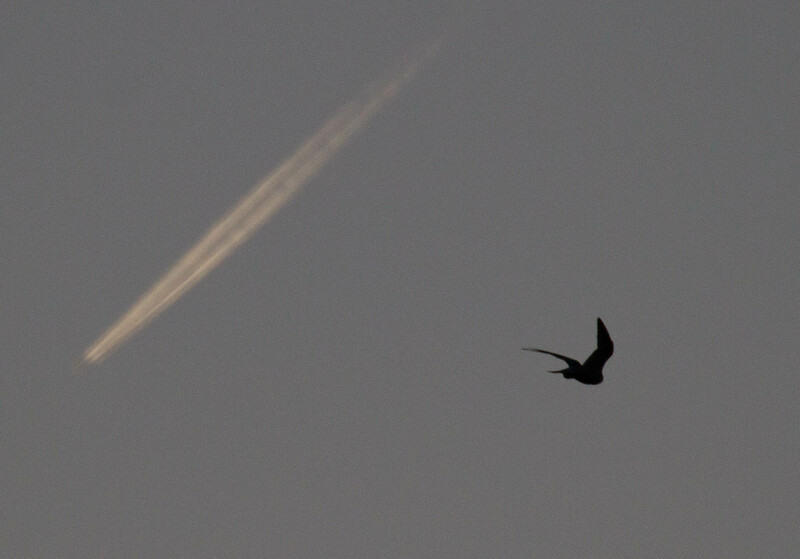 Of interest a small flock of Starlings circled the turrets, coming in to roost as the sky darkened, which they do most evenings. 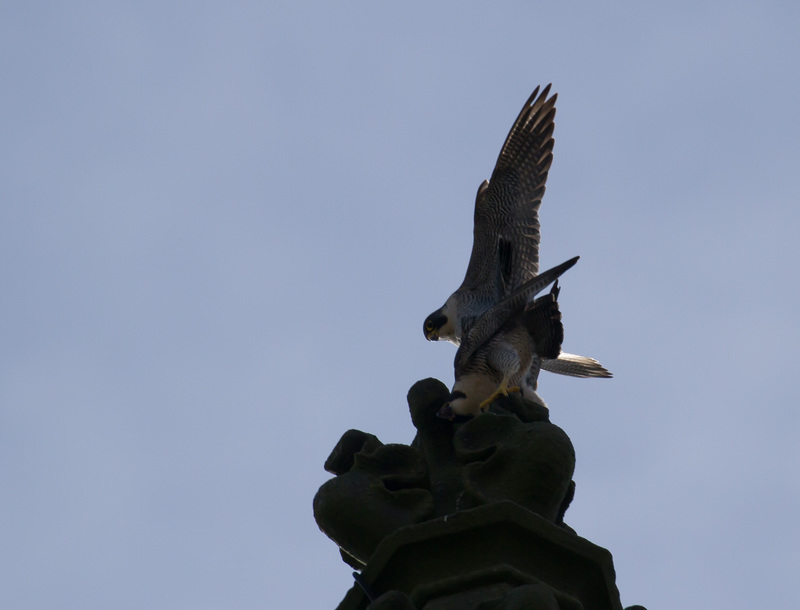 A visit today revealed plenty of activity, and the pair was observed copulating on the top of one of the turrets this afternoon, so further eggs should be expected. 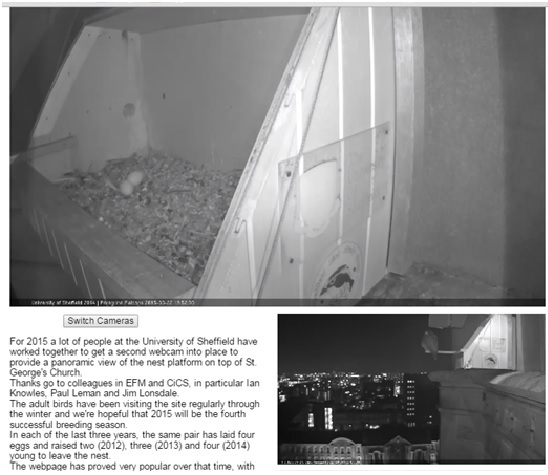 In both of the previous two years covered by the webcam the female has laid four eggs, and according to the literature they often have the same clutch size from year to year. It was also apparent that there’s an adult close to the nest even when there’s not one visible via the webcams, so the eggs are being well looked after. 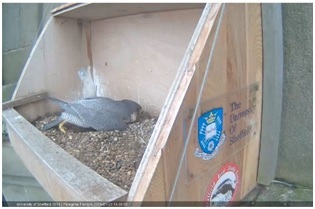 The female is on guard again tonight from the perch, though last night she was on the box next to the egg. 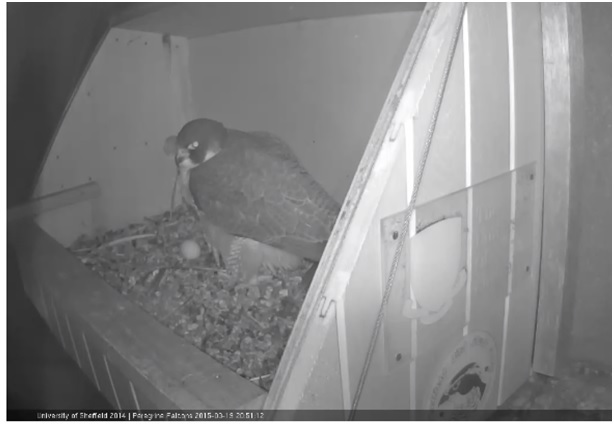 It’s unlikely that a third egg would appear sooner than 48 hours after the last, so my guess would be some time on Tuesday morning, perhaps early on. 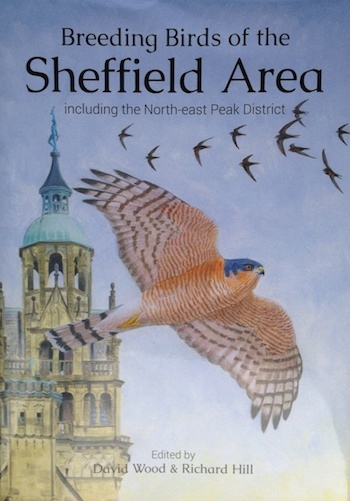 Once incubation begins in earnest, there will be a definite lull in activity, with one bird or another almost constantly on the eggs, so the next few days will be a good chance to see both birds around the church tower for anyone who is in or around Sheffield. This afternoon was very exciting with some great views – as below – I recommend a visit! We have our first egg! 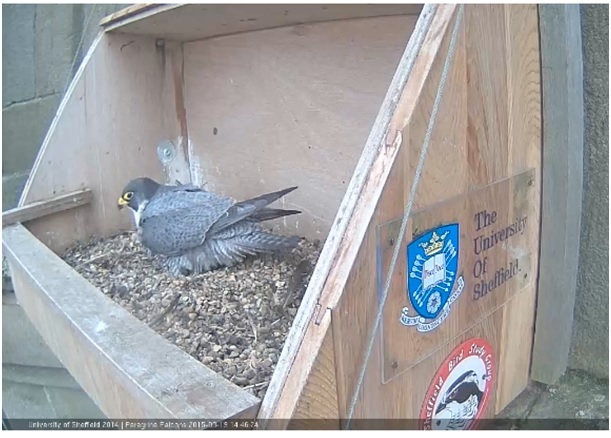 Almost exactly a year to the day since the first egg was laid in 2014 (20th March) and a week ahead of 2013 the female’s behaviour this morning indicated that something might be about to happen. She spent much of the morning in the nest box with her ventral feathers ‘deployed’, giving her a ragged look, as below. 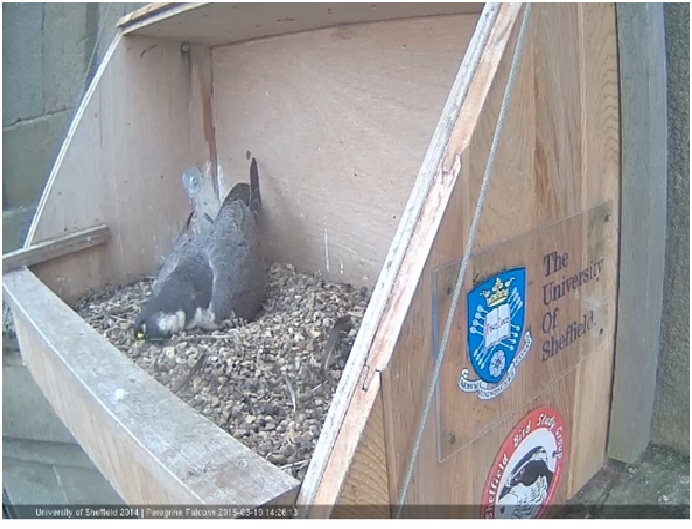 Around 13:15 the male joined her on the box and they engaged in some ‘bowing’, after which I went for some lunch. 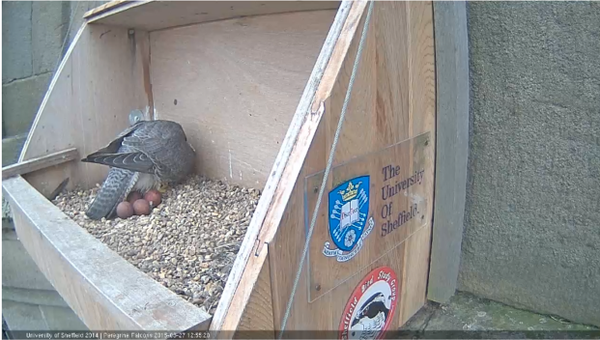 Of course, by the time I next checked the webcam, there was an egg, apparently laid just after 13:30. 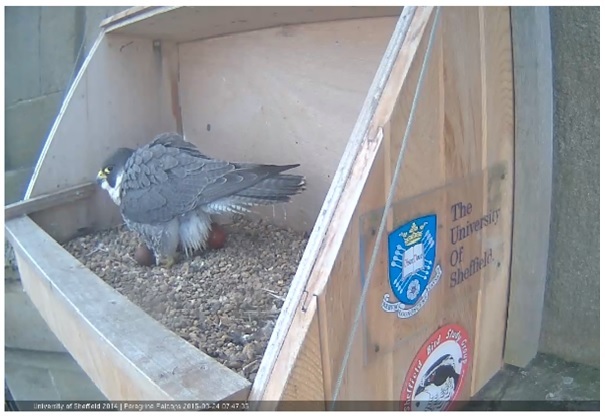 The female spent the next 45 minutes standing over the egg, initially without brooding it, looking pretty drained. She did subsequently settle down on the egg and began to pull pebbles up towards her, apparently building the lip of the scrape to make a more pronounced cup. 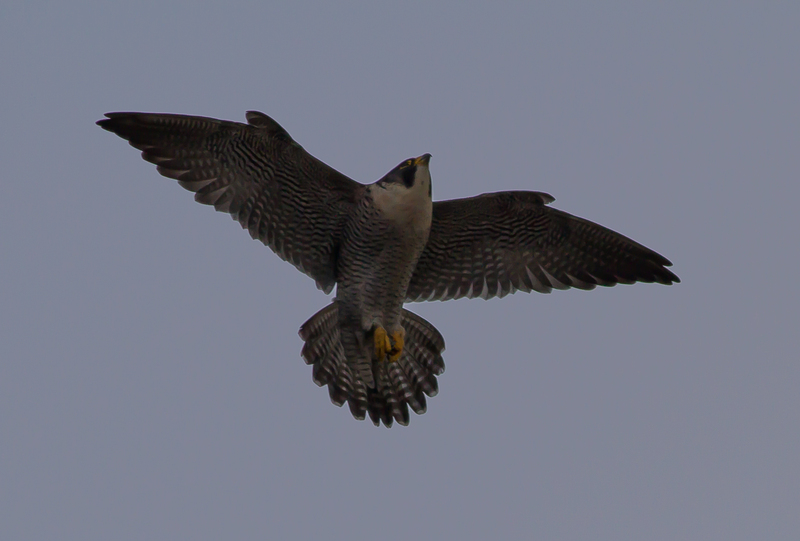 Around 14:30 the male arrived on a nearby ledge with some prey and after some calling she promptly flew off. 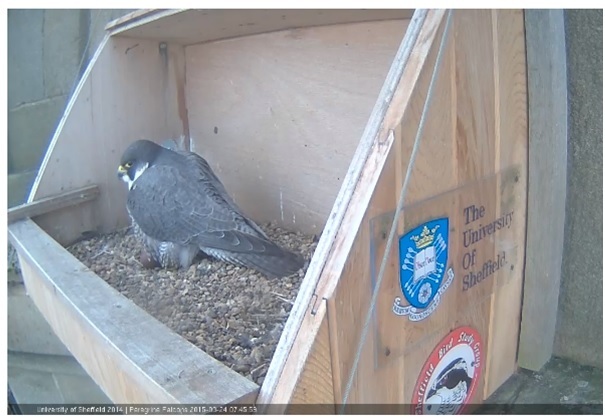 Shortly after this the male (identified by his more complete black hood, especially on the cheek, as well as smaller size and ring on his right leg) came onto the box and soon started brooding the egg, all this within about an hour of it having been laid. 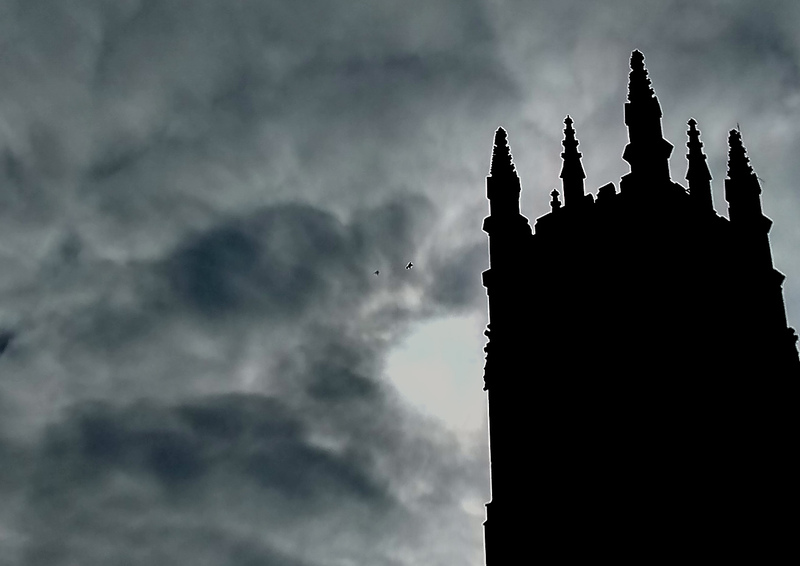 A distant view of the church after work showed both birds to be around, one on the perch and one on the turrets. 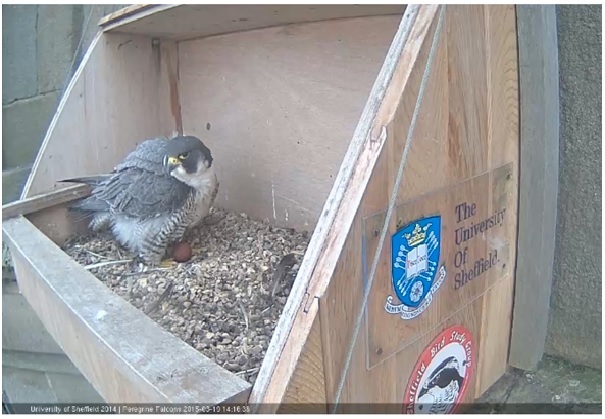 With an egg in the box they’re unlikely to leave it unattended and the next few weeks will give excellent opportunities to watch the adults around the church, perhaps seeing off any potential threats to the eggs such as Crows and gulls. 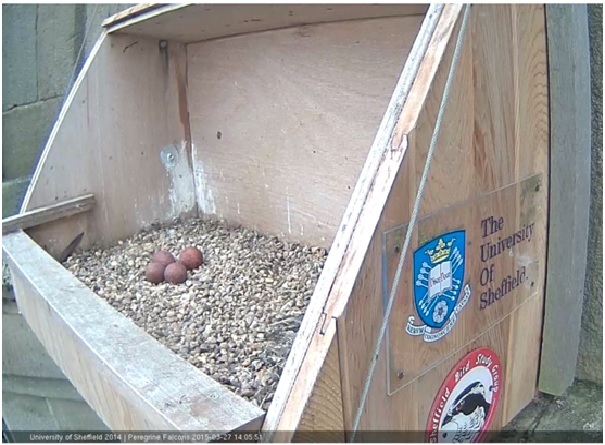 Last year the four eggs were laid over the space of a week, with roughly 54, 70 and 49 hours between them, so we’ll see how that compares to the situation this year. It seems unlikely another egg will be laid tomorrow (Friday), but Saturday afternoon could be worth watching! 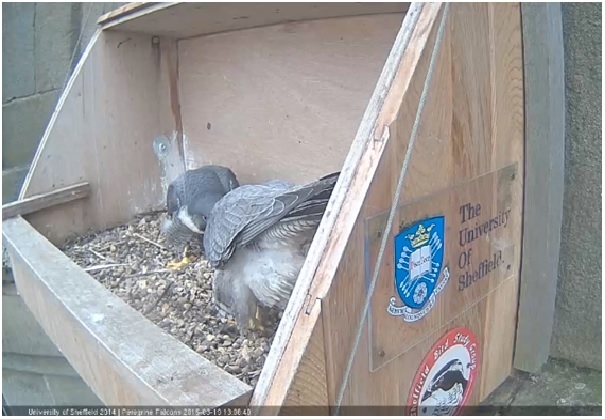 Tonight the female’s on guard in the box, though not actually brooding. This is quite normal, and nothing to worry about as brooding in earnest is only likely to begin once the clutch is complete, or nearly complete. In the meantime the eggs are pretty resilient to begin left exposed to the elements for a few hours at a stretch and the adults will be watchful somewhere nearby, even if they’re not visible via the webcams. Here we go again on another breeding attempt: let’s hope it all goes as well as last year. Although it’s been quiet on the blog for the last few months, we’ve been busy behind the scenes making sure everything is in place for the 2015 breeding season. A lot of people have helped ensure we’re all set for what we hope will be a fourth consecutive breeding attempt by our resident pair. The nest has been cleaned to reduce the risk of infection and parasites, and a second webcam has been installed to provide a panoramic view. 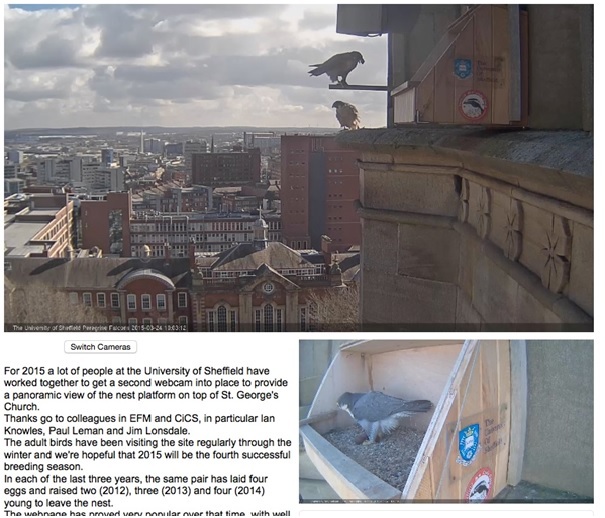 In the screengrab below (at an experimental stage) the female was in the box as the male flew in to land on the perch, though he’d have remained invisible with just the original camera. Many thanks to everyone involved in getting all of this sorted, notably Karl Evans, Ian Knowles, Jim Lonsdale and Paul Leman. 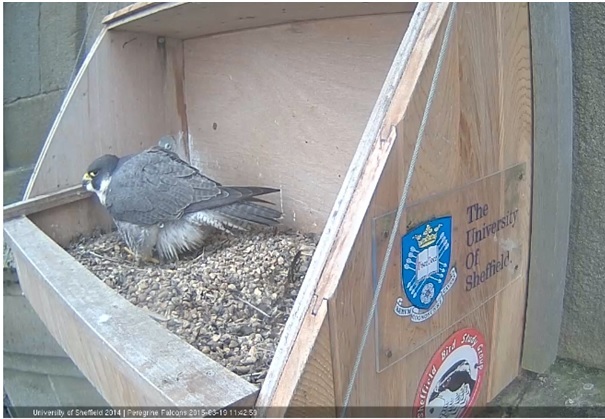 After various trials, this new webcam arrangement is now available to view and should provide much enjoyment over the months ahead as well as the chance to learn more about the birds’ behaviour. Another important development since last year is the near completion of the new ‘Diamond’ building on the site to the west of the church, which has meant the departure of the cranes and (more importantly) the crane operator. Thankfully, the birds do not seem unduly troubled by the new building, which is a little lower than their platform, and they have been regularly on the platform and surrounding ledges. Back in January the pair was engaged in courtship bowing on the platform, pictured above pre-clean out, apparently part of the process of reaffirming their pair bond. And since then the male in particular has been spending quite a bit of time scraping out what will become the nest, as in the screengrab below. The pair has also been observed copulating on the roof of a hotel in the city centre in the last few days, so things are definitely looking promising. On a visit yesterday the male was on the perching post when I arrived, but the female flew in soon afterwards but remained out of sight of the camera on one of the turrets. Further indication that they have occupied their territory came when she made a couple of sorties to chase off Crows that flew across the churchyard, although the local Magpies were below bothering with, despite their chattering and inspections. 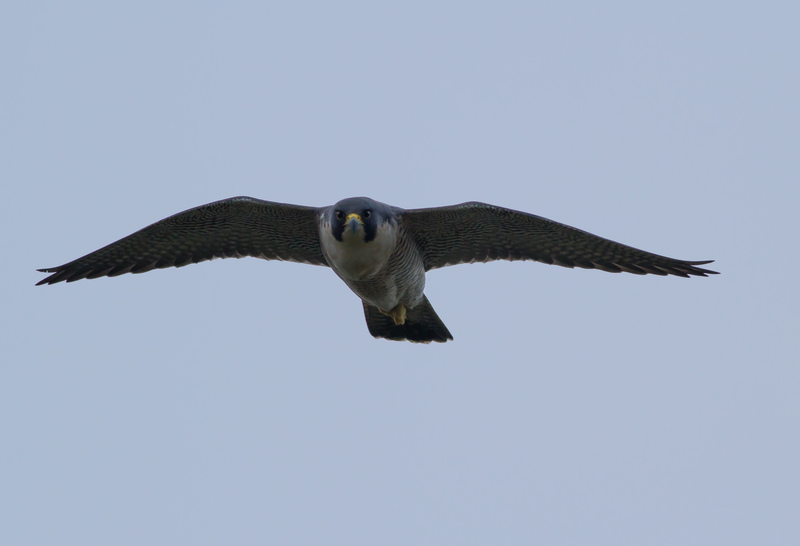 On returning from one flight, the female flew low overhead and provided a blood-tingling moment as she fixed me with a stare. So the 2015 season is under way, with fingers crossed for another successful season. Updates to the blog will be made from time to time as things start to take shape. It’s likely to be a few weeks until any eggs are laid, but no doubt plenty to watch and enjoy in the meantime.